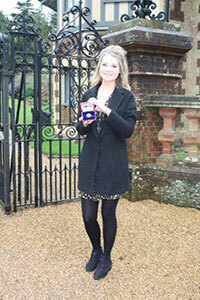 Hannah Hodges, a former student at King Edward VII Academy, was presented with The Queen’s Gold Medal, the academy’s prestigious academic award, during an audience with The Queen at Sandringham House, on Sunday 24 January, 2016. The 19-year-old was joined by her parents, Teresa and Jeremy, her younger sister Niamh and Principal Craig Morrison for the presentation. Hannah joined KES Academy sixth form after achieving an impressive string of A* grades at GCSE from her time at Sacred Heart School, in Swaffham. She continued to impress staff, achieving straight A* grades in Philosophy and Ethics, English Literature and French. She is currently taking a gap year spending time in France, studying in Lyon and putting her language skills into practice.Her schooling will continue back in the UK in September, when she is set to start at Oxford to continue her study of languages, reading French and Beginners German. Hannah, from King’s Lynn, said: “I am really flattered to have received this award and honored to be presented it by The Queen. I have had a fantastic two years at KES Academy and I am delighted with the outcome of my results.